Halonoproctidae – Wiki der Arachnologischen Gesellschaft e. V.
Godwin R. L., Opatova V., Garrison N. L., Hamilton C. A. 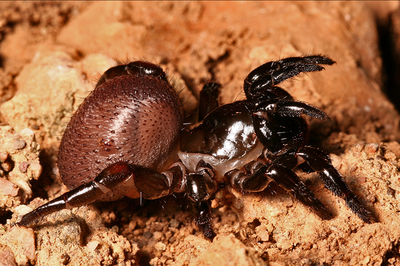 & Bond J. E. (2018): Phylogeny of a cosmopolitan family of morphologically conserved trapdoor spiders (Mygalomorphae, Ctenizidae) using Anchored Hybrid Enrichment, with a description of the family, Halonoproctidae Pocock 1901. Molecular Phylogenetics and Evolution 126, 303–313, doi:10.1016/j.ympev.2018.04.008.